One of the highlights of the ACFW conference was getting to see very good friends and making new ones. Stuart Stockton (AKA S-Man on Brandilyn Collins' Scenes and Beans blog and her new novel, Violet Dawn) was the first one I saw when I walked through the door of the hotel. Soon after I met John Otte, my first conference mentee, who I recognized from his photos but who shocked me with his impressive height. Stuart is tall, but John is TALL. Then came Heather Diane Tipton (yes, I KNEW you this year!! 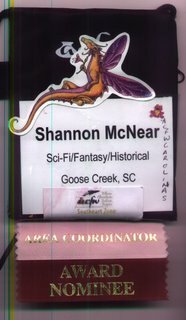 ), and the blur of registration, during which time I found that I had these funny ribbons to place at the bottom of my nametag. 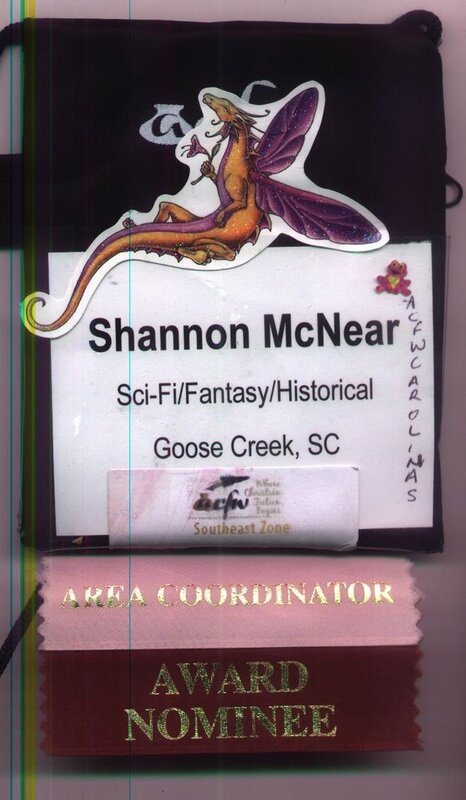 One says "Area Coordinator" (I am, for ACFWCarolinas, which I attempted to print neatly down the side of the nametag but goofed up on), and Award Nominee (my status as a Genesis finalist). 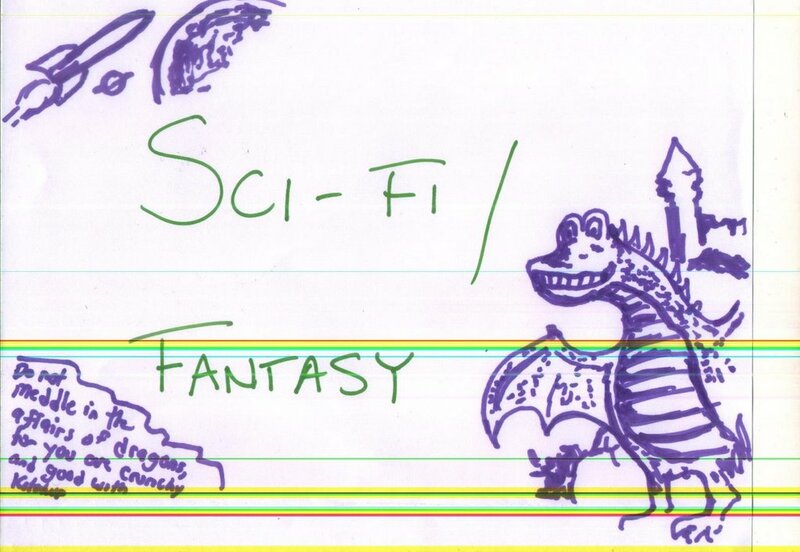 I collected several decorations to indicate affiliation with different groups: the most obvious is the dragon, variations upon which we SF/F writers wore; the frog, for members of Faith*in*Fiction, the writers' forum started by Dave Long of Bethany House; and the white ACFW Southeast Zone sticker for members of that group. I also met the famed Becky Miller (the real one, not the secret one), Steve (who styles himself as Dr. Elwin Ransom on the ACFW forum), Jackie Castle, a sweet young lady named Kaci (Kacy?) who came to the conference after finding out Bryan Davis would be there, Tracy Higley (author of Fallen from Babel and Marduk's Tablet), John Olson (of Oxygen and The Fifth Man fame), Tim Hicks, Ryan Smith, and Jim Sanders. I also had the blessing of renewed friendships with Beth Goddard (fellow Genesis finalist and crit partner), Ronie Kendig (crit partner extraordinaire), Tiff Miller (smiling face behind the scenes of many ACFW conferences), Bryan Davis, author of the Dragons In Our Midst series, and Tim Wise, who I met two years ago at my last Christian Writers Guild conference in Asheville. 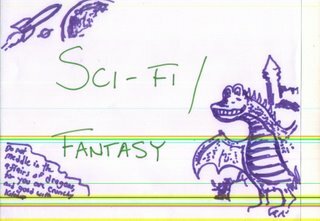 There were a smattering of others discovered throughout the weekend as fellow SF/F writers and/or enthusiasts, and several of us met at what I've dubbed the first annual ACFW-CON SF/F party, on Thursday night. Beth Goddard has posted a picture and summary at her blog. You had it right; it's Kaci. And hi! I found you. 0=) It was a pleasure meeting you. I had a blast.